Archos has laid a shining new golden egg in the form of the Archos 704 Wifi [sic]. 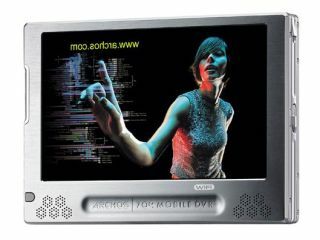 It's an 80GB portable video player with a whopping 7-inch screen. It succeeds the 604 Wifi as the company's flagship portable media device, and its trump card is the built-in Wi-Fi capabilities. The wireless functionality means that users need not carry around a USB 2.0 cable wherever they go on the off-chance that they'll need to copy across a new movie or an album of MP3s. Instead, they can connect to any PC or Mac via wireless networking. For those of you who like to digest music and movies whilst on the go, this is especially ideal. Compared to the likes of the 80GB iPod and the Creative Vision:m , this a vastly better player for watching videos. Those other players, whilst having nice, sharp colour screens, are much smaller and not great for lengthy train journeys. It'll go on sale at the end of April; we'll have a price for you soon.